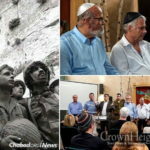 Approximately thirty soldiers from the haredi paratrooper company, known as Chetz, received their red berets Thursday in a ceremony that took place at Jerusalem’s Ammunition Hill, a national memorial site commemorating the valor and heroism of the paratroopers who fought to liberate Jerusalem during the Six Day War. 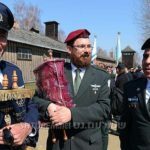 Among the new paratroopers is one Joe Brickman, a native of Crown Heights in Brooklyn, NY, and a grandson of Colonel Rabbi Jacob Goldstein, former chief chaplain of the New York Army National Guard. 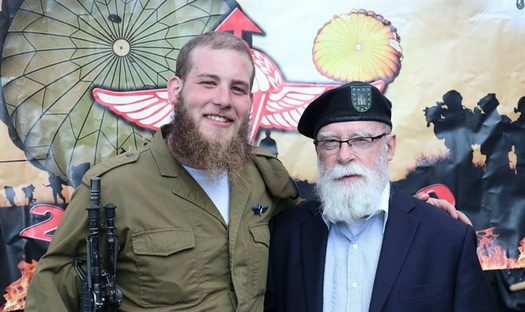 Rabbi Goldstein made a special trip to Israel in order to attend the ceremony and congratulate his grandson and fellow soldiers. Rabbi Goldstein, who served in the US Army for 38 years, enlisted after receiving a blessing from the Lubavitcher Rebbe, Rabbi Menachem Mendel Shneerson. 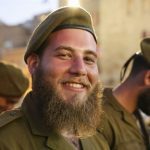 Goldstein was seen as something of a trailblazer, the very first soldier to receive a military exemption from shaving his beard. His military career led him around the world, to Bosnia, South Korea, Afghanistan, Cuba and Iraq. During the Gulf War, Goldstein traveled to Israel along with an American delegation, and during the 9/11 attacks, his National Guard unit was among the first to arrive on the terror scene in Manhattan. Throughout close to four decades of devoted service, Rabbi Goldstein loyally serviced the spiritual and moral needs of Jewish men and women in uniform. Yossi you come a long way since Empire Shpietl. your father would be proud of you.